There are so many wonderful things about this season over here in the UK (putting up the Christmas tree and decorations while watching slushy Christmas movies – check, drinking mulled wine at the Christmas markets – check, the beginning of pretty frosty mornings – big fat check), but the ever-shorter December days are not one of them. As we both work from home, Mr. Scrummy and I look forward to our morning walk, but over the last couple of weeks our 7.30ish departures have been shrouded in a cloak of complete darkness. Eventually, as we walk, a faint glow in the east does become some sort of daylight, but for what seems like just a few short hours before the dusk draws in. Having grown up in the UK I shouldn’t be at all shocked by this, really, but after quite a few years of living abroad where the winter daylight hours are slightly more reasonable, my jaw is still almost dropping open in shock each day when I emerge from my house or a café or shopping mall or wherever at 3.30pm and it’s almost dark again. All I can say is thank goodness for summer when the situation is reversed and it’s light until nearly 10pm (but let’s not tease ourselves for too long with that thought). 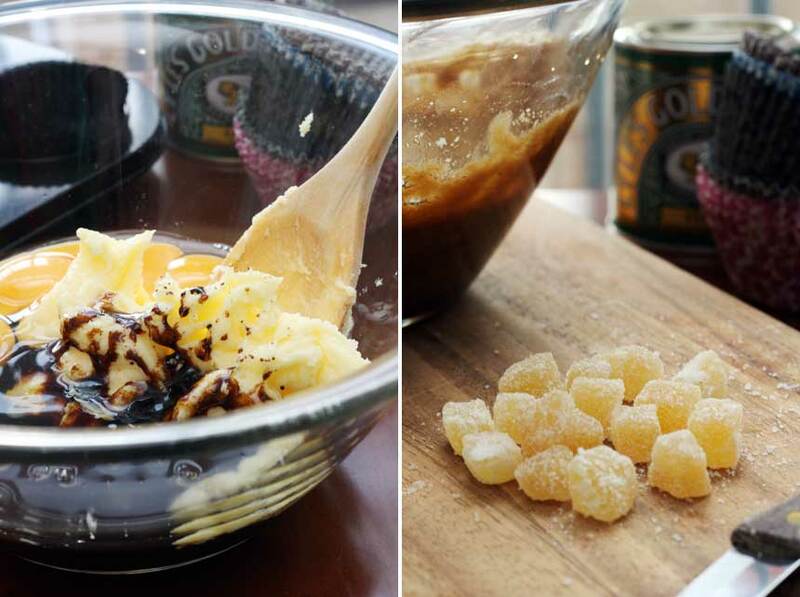 Add crystallised ginger for an extra gingery ‘hit’! So back to December and perhaps as you may have guessed I’m not too much of a loving-staying-at-home-while-it’s-dark-and-miserable-outside sort of person. But one consolation, I guess, is all the Christmassy preparations there are to do, like wrapping up gifts and … baking, of course! To be totally honest with you, I’m not a huge Christmas baker, because I’m not a huge baker in general, but this year I’m definitely ‘having a dabble’. 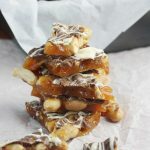 Being back close to home means that there are more appreciative mouths to cater for than usual, and so I’m busy practising and preparing a few sweet treats for this holiday season. 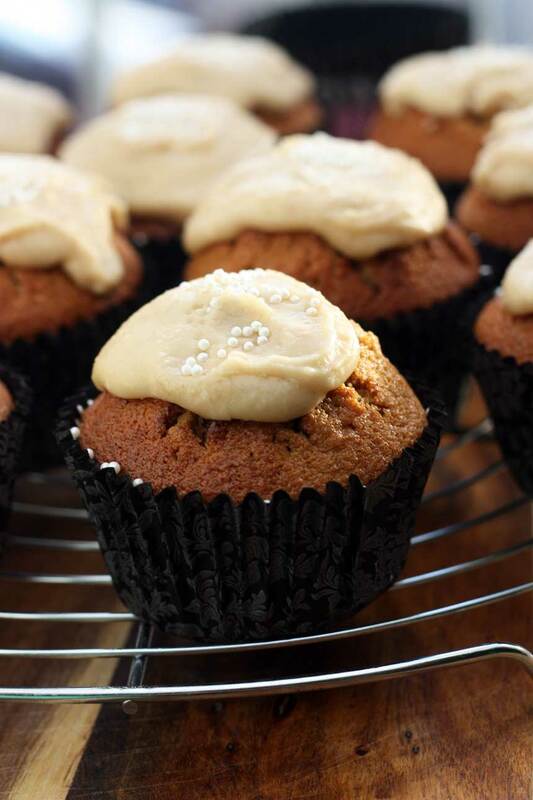 So first up … these quintessentially Christmas gingerbread muffins. I decided to jazz them up a little and make them gingerbread muffins with salted caramel frosting, just to be extra delicious about it all. Which also means that you are allowed to call them cupcakes if you like. 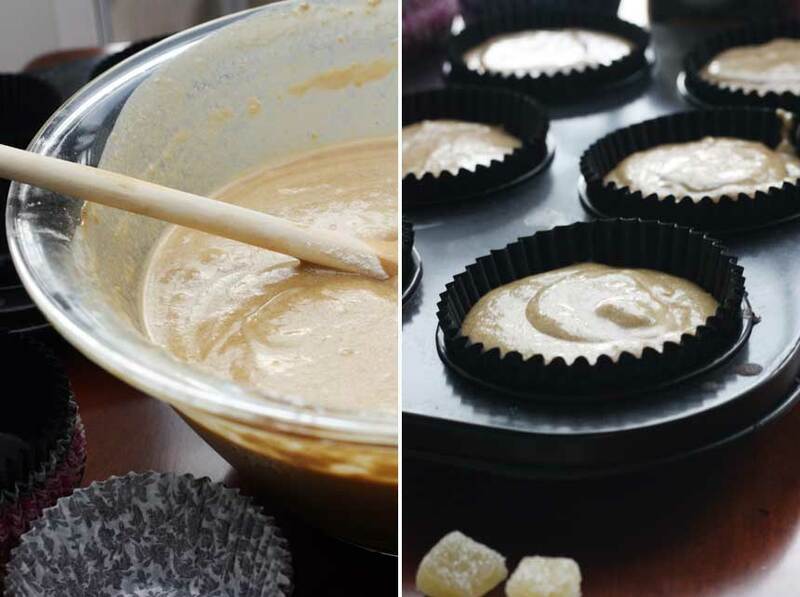 I decided to go for giving these muffins quite a hit of gingery flavour by including a triple hit of ginger: four whole teaspoons of the ground stuff, a piece of fresh grated ginger and some chopped crystallised ginger for a bit of gingery texture. Grated nutmeg adds some extra spice and one huge spoonful each of black treacle (possibly molasses to you) and golden syrup (don’t worry, you can use corn syrup and molasses as a substitute if you can’t find this classic British ingredient) gives these little cakes that classic gingerbread quality. Don’t expect a heavy, sticky result, though. 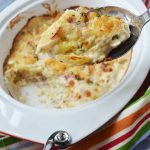 The batter bakes up to a lovely light and fluffy crumb with a firm top. 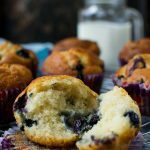 The muffins end up just a little bit sticky and squidgy but definitely without losing the characteristic lightness you expect from a muffin. Just right. To be honest, you could leave the muffins like this and enjoy them plain with a cup of tea or coffee. 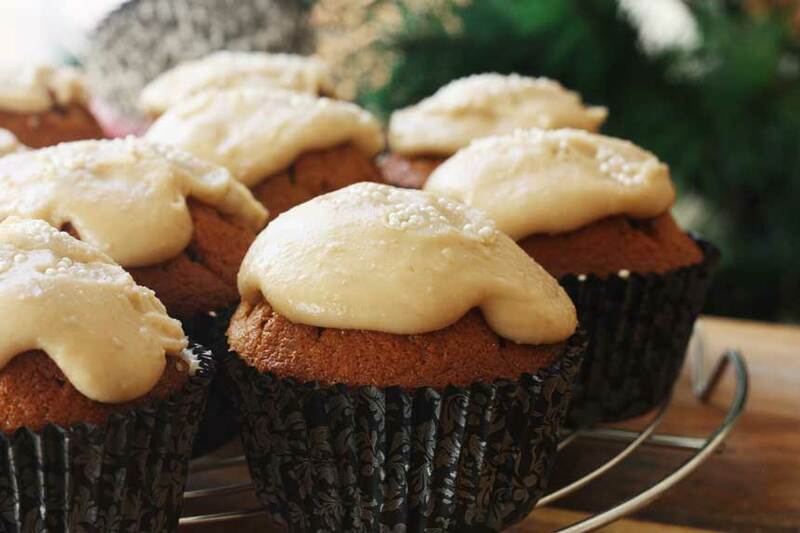 On the other hand, though, it is Christmas, which comes but once a year, so I say go ahead and be a devil – whip up some of that salted caramel frosting to dollop over the top! I have to admit this does leave you with something more like a cupcake, but you can always go easy on the frosting if you don’t want the overall effect to be too sweet. I hope you decide to give these little beauties a go. Apart from anything else, they will permeate your home with the most delectable spicy, gingery, caramel-y aroma. Pretty hard to resist! These muffins are a cross between a classic gingerbread and a lighter muffin. Top them with a salted caramel flavour frosting and they're pretty much Christmassy cakey perfection! 3 tablespoons milk or cream for a richer frosting! Preheat the oven to 190C/375F. Line a muffin tin (12 holes) with muffin cases and set aside. Cream together the butter and sugar with a handheld whisk until light and fluffy, then whisk in the treacle/molasses, golden syrup (or equivalent – see notes) and eggs & egg yolks until well mixed. Stir in the grated fresh ginger and chopped crystallised ginger. Mix together the flour, ground ginger, nutmeg, baking powder and salt in a medium bowl. Add half of these dry ingredients to the wet mixture and mix together, then add half of the milk followed by the rest of the dry ingredients and the rest of the milk. Mix everything together well (but don’t overmix). Spoon the mixture into the muffin cases (I used a small ladle as the mixture is quite runny. You can fill them quite full – just leave at least a cm or so at the top) then bake for about 20 minutes or until the muffins are well risen and firm on top. Cool the muffins on a cooling rack. Meanwhile, make the frosting. In a small pan over medium heat, melt the butter, then add the milk/cream and sugar and let it all bubble quite vigorously for about a minute. Take off the heat, then slowly add the icing sugar. If the frosting is a little too thick, add a tiny bit more milk. If it’s a little too thin, add a bit more icing sugar. Finally, stir in the vanilla extract and salt. Dollop about a teaspoon or so of frosting onto each muffin and, if you like, decorate with sugar decorations. Adapted from BBC Food. Golden syrup is made by a company called Lyles in the UK. 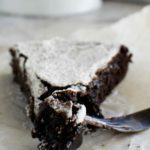 If you can’t find it where you are (sometimes you can find it in specialist food stores or foreign food sections in supermarkets abroad) then you can substitute with half molasses and half corn syrup. I appreciate that some of you may find it difficult to find crystallised ginger (it’s common here in the UK, especially close to Christmas). If you do, add in a little extra grated fresh ginger instead. If you would like to add some sugar decorations at the end, make sure you add them pretty quickly. The frosting sets pretty fast! Tiropita (mini feta cheese triangles) 30 minute healthy chocolate cake Greek Christmas honey cookies (melomakarona) Leftover turkey, bacon and brussels sprouts macaroni cheese (Christmas macaroni!) cranberry and walnut cheese truffles Chocolate lollipops (homemade food gift with video) Sticky apple and ginger cake bars Creamy turkey, bacon and brussels sprouts linguine (great for leftovers!) 11 easy homemade chocolate gifts The easiest peanut butter cups in a jar (homemade food gift!) 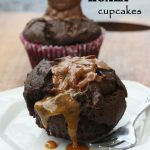 Toffee apple chocolate bark Chocolate stout cupcakes with peanut butter frosting tangerine, walnut & choc chip muffins FIVE last-minute chocolate gift ideas! Now this is my kind of ginger recipe. I miss Christmas in England, but I don’t miss the weather. Lovely recipe. Hi Helen, your muffins are beautiful, gingerbread is one of my favorite flavors any time of the year. I found crystalized ginger at the Whole Foods Market here in the US before, so I will look again. Happy Holidays! 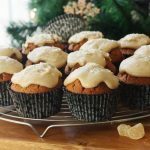 How funny is this – we both posted gingerbread muffin recipes today! I like the caramel frosting on yours. SO good, Helen! Aw, I love that … great minds and all that!! Yours were great, too! 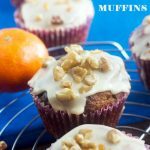 I am obsessed with all things gingerbread right now and these muffins sound completely fantastic!! Want to send me a few?? Helen these muffins look wonderful. I want that frosting. Ha … I must admit that’s one tasty frosting!! 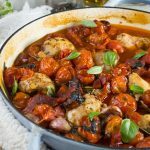 Helen, avec cette recette même s’il fait froid dehors et noir, on peut être que heureux! Elle pareil divine ! Le caramel fondant en dessus doit être super bon ! I absolutely hate leaving work in the dark and coming home in it as well. It’s so depressing! Sigh. 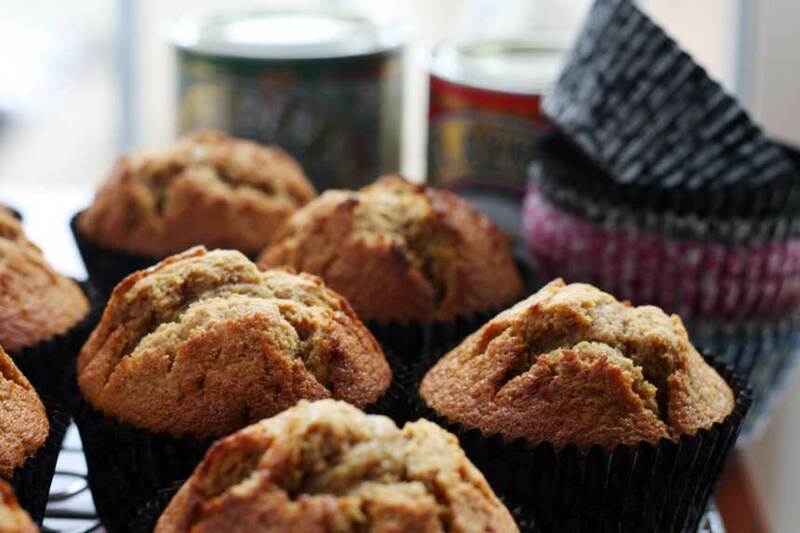 At least there are fun things to be eaten at this time of year…case in point these muffins! The salted caramel frosting is a fabulous addition. Me too, me too! Today, I needed to pop out to the post office and just couldn’t believe that it was almost dark already … at just after 3.30pm! Yuck! So yes, thank goodness for nice things to eat to cheer us up! Glad you like these muffins! 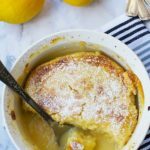 You have hit on some of my favorite dessert flavors – ginger AND salted caramel, and you’ve made it into one dessert – yum!!! I think I could eat these for dessert, as a snack, for breakfast…. Ha … glad you like these, Kathleen! I must admit that the ginger and caramel goes really well together. I wish they’d all get finished up though because they are proving to be quite a temptation! Hahaha … I was thinking that today as I was scoffing my third one of these muffins since I made them … I could very easily eat a whole lot more of that frosting! Christmas with the family is always fun! I love that you posted a baking recipe, these are awesome! I rarely bake gingerbread, but will try these. Pinned! I hope you do try these, Mira … thanks for pinning! I think you are either in love with gingerbread or not. I’m in the in total love with it camp. It’s my all time favorite thing….ever…I’m drooling over these muffins right now. Staring at them in disbelief. Everything I love about Christmas, you just nailed all the right flavors in here to tickle the tastebuds. Wonderful. Pinned!! Thanks so much for pinning, Laura! I have been eating these all week and am almost wishing for them to be gone so that I’m not tempted any more! I can wholeheartedly recommend them if you’re a gingerbread lover! 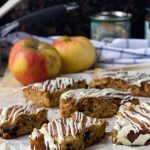 Ginger and caramel – you think of the best combinations! Triple threat, too, on the ginger, I like! I bet these are great and so holiday! Enjoy your Christmas back home! Thanks, Lori – so happy you like these. I have to admit that the ginger and caramel goes really really well together. Hope you have a wonderful Christmas, too! I totally agree that it’s a good job Christmas is right smack in the middle of winter to keep us from getting too down in the dumps. Happy you like the muffins – I’m really pleased with them! Gingerbread is just about my favorite Christmas flavor, Helen! It always reminds me of my Grandma. She would make gingerbread cookies every Christmas growing up and the it has stuck with me. I love the salted caramel frosting over these cuties! Such a wonderful idea. Sounds like the perfect dessert or snack to me! I am down for the triple ginger in these muffins!! Amazing!! I love your Christmas baking “dabbling” — gingerbread is my favorite, and with salted caramel frosting, even better! I can’t believe how early it gets dark over there, but baking should help pass the time. You say you’re not much of a baker, but you outdid yourself with these quadruple ginger muffins! Love these! Oooh, I LOVE this flavour combo!! Brilliant! Even just for the frosting alone – salted caramel frosting?? It’s got my name all over it!!! Ha … thanks, Nagi! Really happy you approve! This might just be my favourite ever Christmas recipe. I am obsessed with anything that has salted caramel on it. It’s just so good, isn’t it! Amazing … I’m totally addicted to these this week! Glad you like them, Dannii! I am not a huge Christmas baker either but you have just go to have some gingerbread in there right? Ooooh, I didn’t know you were in the UK Helen! SO close to me! I used to live near Milton Keynes and in Brighton a few years back – I know ALL about horrible British weather 🙂 Your muffins look amazing – love the frosting! 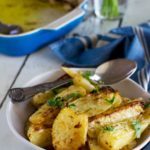 Tried these today, I halved the ingredients as I wanted to ‘test’ the recipe – and I didn’t have any fresh ginger so left that out but they were still Deeeelish – suffice it to say next time this recipe will not be halved as they are all gone already! If you like gingerbread you will love these babies. Thank you so much for the recipe – after just one bake I know this will go into my book as my go-to gingerbread recipe. Next time I am going to try it as a traybake!! Wonderful to hear this, Odette – thank you so much for leaving your lovely feedback! I make these every Christmas, but I should make them all year round really – they always go down really well at our house!